1 of 3 Heat a grill or grill pan to medium-high heat. In a large bowl, whisk together olive oil, vinegar, mustard, salt and pepper. Set aside. 2 of 3 Cut bread loaf in half crosswise, then cut each half lengthwise into four 1-inch-thick slices, for a total of 8 slices. Brush slices lightly with olive oil. Grill 2 minutes per side; set aside. Lightly brush onion quarters with olive oil. Grill 5 minutes; rotate and grill another 5 minutes. 3 of 3 Cut bread slices into 1-inch cubes. Cut onion quarters into thin slices. 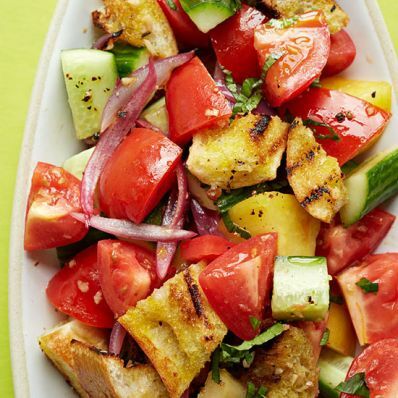 Toss bread, onion, tomatoes, cucumber, garlic and basil in dressing. Cover and let stand for 30 minutes to allow flavors to combine.